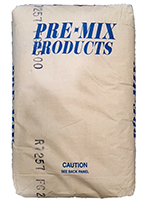 PMP Fine Grout with Grout Additive is a preblended grout for filling masonry cavities, door frames, and concrete patching and grouting. It is a blend of washed sand, Type II cement 2 1/2:1 and PMP Grout Additive. PMP Fine Grout with Grout Additive is formulated to achieve a minimum of 2500 p.s.i. compressive strength when placed at an 8-10 inch slump. The Grout Additive gives the mortar fluid properties at a reduced water cement ratio. It also improves the bond and shrinkage compensation. Fluid at low w/c ratio.